Your tyres are your only contact with the road and affect the steering, braking and direction of your vehicle. Good tyres are needed to drive safely. At Burkes Tyres & Exhausts we offer an extensive range of sizes and brands to cater for all motoring needs, including all low profile sizes 17” 18” 19” 20” in budget and brand names such as Bridgestone, Michelin & Goodyear. We also stock full range of Runflat tyres to suit the BMW and Mini range. With our Corghi Laser 4 Wheel Alingment system and Electronic Wheel Balancer we are using the latest technology to work at your vehicle. All work is carried out to the highest standards by our fully trained staff who will advise on the product best suited to your requirements, at the keenest possible price. If in the event we do not have your size or make in stock when you call, we promise to ring you back within the hour with a price and availability which is usually next working day. 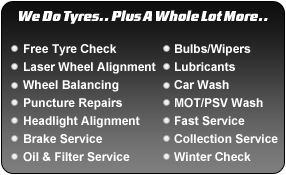 At Burkes Tyres & Exhausts we offer an extensive range of sizes and brands to cater for all commercial vehicles. Truck wheel balancing service is also available. We stock a wide range of agricultural & industrial tyres. Please contact a member of our team who will advise on tyres from a wheelbarrow to an earthmover, including tractors, trailers, implement, forklift and floatation. 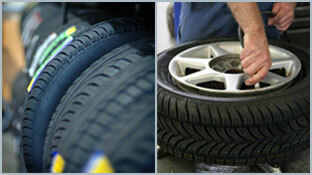 We offer a fast and reliable puncture repair service on any repairable tyre while u wait.